Brexit day may have been delayed by two weeks, but British factories are taking no chances with the risks to supply chains that would result from a messy divorce between the UK and European Union. 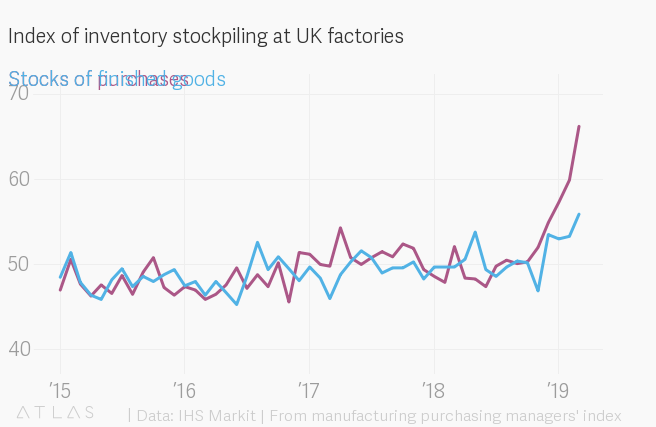 In the latest purchasing managers’ index of the UK’s manufacturing industry, released today, data showed a massive increase in stockpiling (pdf). The index measuring inventory of raw materials jumped to 66.2 in March, from 59.9 the month before. In this survey, 50 marks the threshold between expansion and contraction. Prior to 2019, the highest this index had reached was 55, according to IHS Markit. More than 40% of firms said they had increased their inventory of materials; 80% said the reason was to get ahead of Brexit, particularly imports from the EU. 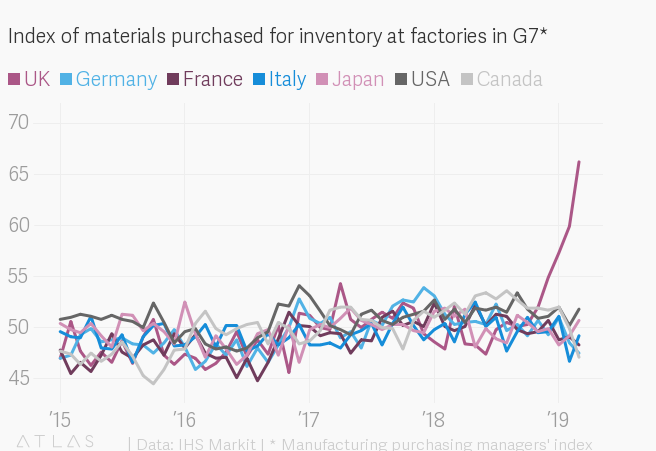 IHS Markit also said that inventories of finished goods at UK factories recorded the largest monthly increase since data were first collected more than 27 years ago. The upside is that all this stockpiling generated enough activity to lift the overall activity index for the UK’s manufacturing industry to its highest level in 13 months, with the benefits concentrated among larger firms. On the other hand, the surveys also showed businesses elsewhere in Europe removing the UK from their supply chains. Exports of intermediate goods (supplies that serve as inputs to other goods) from the UK have now fallen for nine successive months, IHS Markit said.